Flooding in Laughton. Photo by Eddie Mitchell. There are reports of flooding causing serious delays on the roads near East Hoathly. Traffic is being held up in both directions on the A22, from South Street in East Hoathly to the junction with the B2124. Flooding has also partly blocked the B2124, with delays between Laughton and the A22. 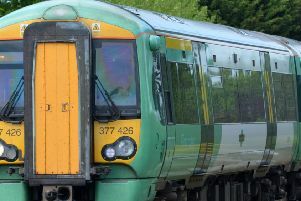 Rail operator Southern says services are disrupted today, due to ‘an unusually high level of train crew shortages’.